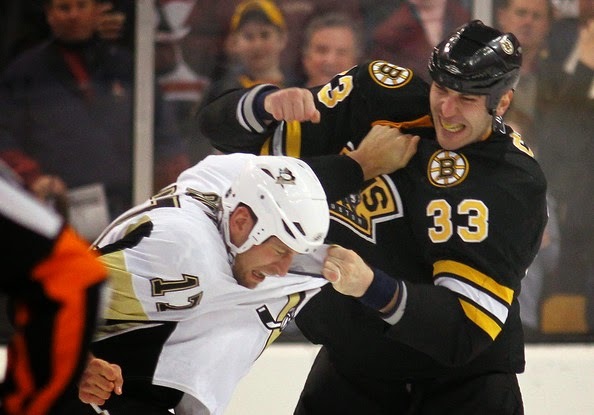 Have the Bruins gotten weaker? The Boston Bruins have always been known as a hard-hitting, gritty, physical team, and it is these attributes that have been and will be key to their success. But, have the Bruins potentially lost their edge? Lost their toughness? And what could that mean for the upcoming season? Over the past few years the Bruins have traded or lost several key players who exemplified that classic Boston tenacity. Let’s start with the obvious, the most recent, Johnny Boychuk, who has been traded out of the black and gold and into the orange and blue of Long Island. Boychuk was a Bruin through and through. He had his teammates back, he showed up to the rink each night ready to play, and more importantly was always ready and willing to punish opponents physically. Boychuk’s strength and reliability will be missed and it will be up to the young Bruins defensemen to fill that gap, specifically Kevan Miller. Shawn Thornton will now be playing hockey and dropping the gloves in South Florida this season, leaving the fourth line and the bruins without their typical grinder. Thornton’s production in terms of goals and assists won’t be missed, but his fiery emotion, which permeated the whole team, will be. Just remember game three of the 2011 Stanley Cup Finals when Thornton hit the ice—and several Canucks within seconds—the Garden was rocking, the team was flying and we all know how that series ended. Jarome Iginla was welcomed to Boston in 2012 and in his first game dropped the gloves, which immediately endeared him to the Bruins nation. He continued to be a grisly veteran throughout the season, all while finding the back of the net quite often. The loss of these players could be concerning to the Bruins style of play during the season and it will be up to the rest of the team to step up and bring the physicality each and every night. Chara, Seidenberg, Lucic, McQuaid and Miller will need to continue to plaster opponents into the boards all season, and Marchand needs to be the pest we all know he can be and Gregory Campbell must stand up for each and every of his teammates. The Bruins must find a way to remain tough, physical and dominating if they hope raise another banner to the rafters.